We're back home now, in fact we've been home a week and are finally nearing the end of the jet lag symptoms. Time for a wrap-up about our time in Northern Europe. Above: The River Orwell as seen from the Suffolk Yacht Harbour boat yard. Notice the tide flats closest to the breakwater, mooring field next, and the navigable portion beyond. 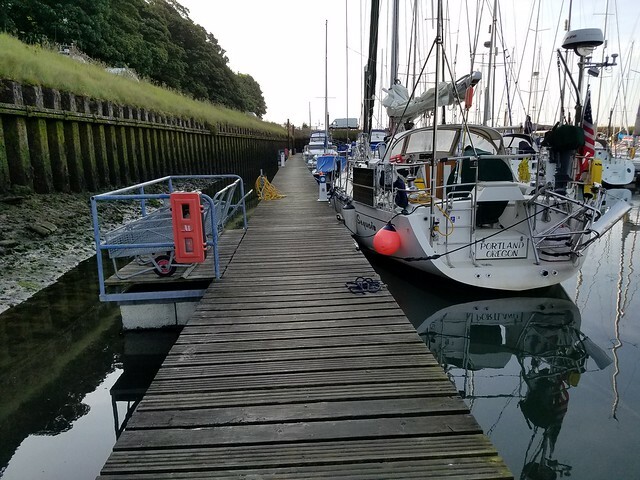 I last wrote when we arrived at Suffolk Yacht Harbour on the River Orwell, near Ipswich. 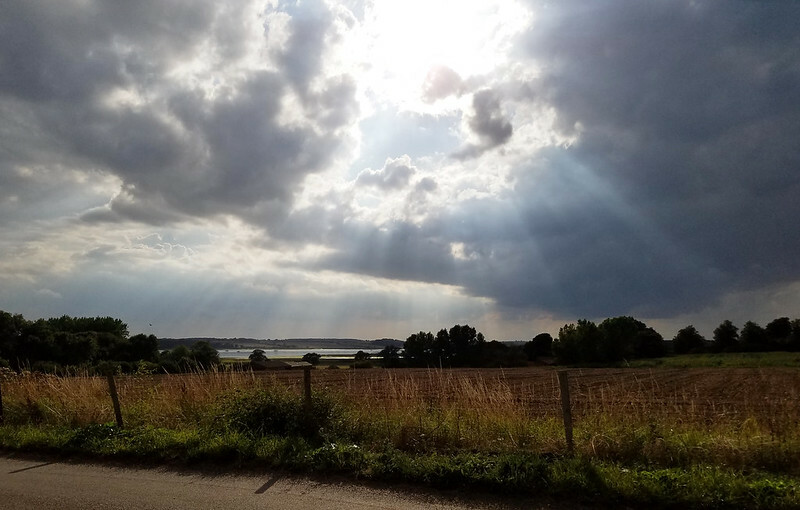 This is an area of England known as East Anglia, and it definitely has a different flavor from many other parts of the UK. The countryside is flat and mostly agricultural. Short rivers break up the coast there, and they seem to have vastly more water movement from the strong tides than they do from any water flowing from inland. 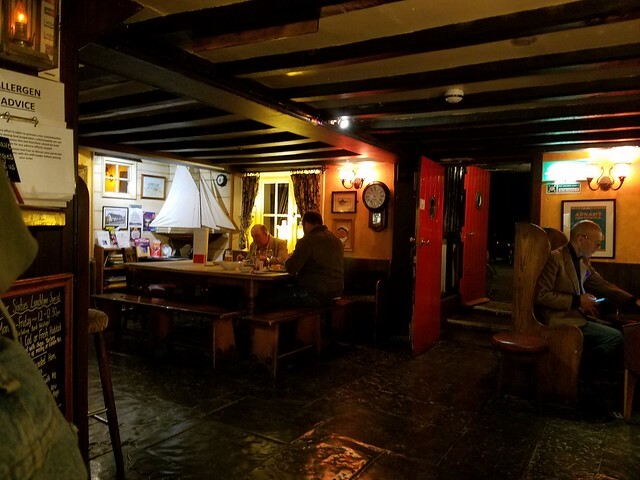 There are plenty of historic and interesting pubs with excellent menus, both for traditional bar food and for more adventurous international dishes. Above: The Ferryboat Inn, north of Felixstowe. 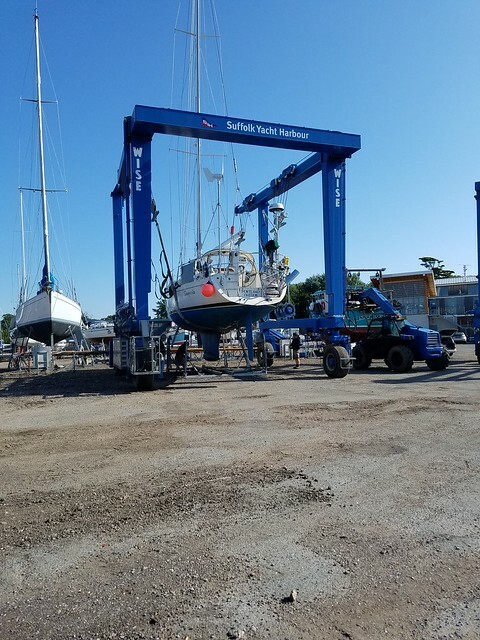 We had made arrangements in advance for a brief period of moorage at Suffolk Yacht Harbour, followed by a haul-out on the first of September and winter storage on the hard. Yet when we called to say we were arriving, they said they had no space. Ultimately, they were willing to put us at the fuel dock until another slip opened up. So we spent the morning at the fuel dock, jockeying around from time to time to allow boats to tie up to another part of the dock, or worse yet, raft alongside us, passing the fuel hose across our deck. Not the best of situations. Finally in the early afternoon a space became available between M and N docks, in a distant portion of the marina. We sailed there during a relatively high tide and secured ourselves to the portion of the dock that runs alongside the shore. Above: Sequoia at low tide in Suffolk Yacht Harbour. There are huge tides in the River Orwell, much like the inland waters of the Pacific Northwest. While we were there the tidal swing seemed to start at about 12 feet, decreasing to about 7 feet later in the month. One other effect of the huge tides was that as the tide fell, our direct line to any cell phone or wireless signals disappeared. If you wanted to have access to the internet, better wait until high tide! We spent a busy and interesting week preparing for the haul-out. We needed to completely winterize the boat, pack our bags to go home, and fix some pesky system problems and deck leaks. We also wanted to arrange with the boatyard for work to be done during the winter, and with a local canvas shop to have our dodger (or as they call it, "spray hood") replaced. The water system was acting up in a number of different ways, and as Craig launched into figuring out what was wrong, many different problems came to light. The water pump was the original one (dating from 2001), but there were many other problems as well. Ultimately he found out that a brass valve had quit working so even when the new pump was installed, the system was still sucking air instead of water. Craig, such a talented engineer, was able to get everything working, although there are touches that will have to be finished up next spring when we return with parts that aren't very available (or not available at all) in Britain. The boat was hauled out as scheduled on September 1, with a minimum of fuss. We moved off the boat to an Airbnb place in Felixstowe. We continued to work like crazy getting the boat ready for winter storage, including plenty of trips to chandleries, hardware stores, laundries, grocery stores, etc. We're fairly satisfied with the condition we left the boat in, although there are inevitably plenty of worries when the boat is 5000 miles away. It doesn't help that with all the hurricane damage in Texas, Florida and the Carribean, we are seeing daily news clips of trashed sailboats. So, what were some of our broad impressions of the summer we just spent on the boat in Northern Europe? Or put another way, is there any advice we would give to other boaters contemplating a similar trip? First is the importance of planning. When we first conceived of this trip, "the Baltic Sea" seemed like a reasonable goal for the summer. Our primary desire was to visit Denmark, Sweden and Finland. But in addition, I contemplated going around the edges of the Baltic Sea, including Germany, Poland and the former Soviet republics of Estonia, Latvia and Lithuania. We thought we'd be able to visit St. Petersburg, Russia. WRONG! It is a vast area, and even the small chunk we attempted would have benefited from being smaller. Yes, you can get to many places, but don't you want to enjoy them when you get there? For instance, we only took two "layover days" in transiting the Göta Canal, and those were the most enjoyable days of all. We should have had five or six layover days so that we could have done more than just cruise by all those lovely places. An issue that affected our whole time there was concern about not overstaying our time in the Schengen zone. (The Schengen Treaty includes more or less the same countries as the EU, with a few additions and subtractions, most notably the UK, which is not in the Schengen zone although it still is - for now - in the EU.) Americans are allowed 90 days in the Schengen countries. There doesn't seem to be any mechanism whatsoever for extending that period of time. Knowing that our exit from the Schengen zone would be via the North Sea, we began to worry by mid-summer about whether we would have adverse weather in the North Sea, and how much of our Schengen zone time should be allocated to waiting for a weather window. As it turns out, we allowed 3 days for waiting in Helgoland, Germany, and that was just enough. There was bad weather (wind as much as 39 knots) which prevented us from leaving before we did. But planning for the end of our Schengen time affected our route choices and our decisions to move on sooner than we might otherwise have wanted to. When we re-enter the Schengen zone next spring, it will be possible they will ask us for proof that we complied with the time limits in 2017. We have passport stamps for the entry, but to prove our exit we'll have to rely on cash register receipts and our boat's log book. There were no immigration officers on Helgoland who could have "checked us out" of the Schengen zone. We spent much more time in marinas during the entire trip than we had expected. In part that was because there were sometimes not good places to anchor, but also there were the excellent marina facilities in so many places and there was the ease of sailing right in and tying up. Many of the bigger, more popular marinas have a young person in a dinghy who is designated as the "host" and who will direct arriving boaters to a particular dock, and who will help with the docking and tie-up in difficult wind conditions. We have talked about the challenges of nose-to-the-dock mooring with poles or buoys to the stern in previous blogs, but we added some aids that wound up being pretty necessary. We made a fender board out of a 2x10 about 6 feet long, and it was absolutely essential in the locks. In Germany we purchased a kit of two 2" ropes to make rub rails when tied to the slotted toe rail. (All boats should have rub rails!). We sprung for an absolutely amazing device called "Hook N Moor", a fiberglass pole that extends to 9' and will pass a line through the eye of a mooring ball. Its mechanical sleight-of-hand is hard to believe; we wound up calling it "the machine". Because our bow pulpit is not open in the middle like all of the European boats, we usually moored stern-to and occasionally used our fender board as a passarelle. All marinas we visited have washers and dryers as well as showers and toilets. Many marinas have a sauna in both the men's and women's shower facilities. In fact saunas become more universal the closer you get to Finland. Electricity is almost always included in the very reasonable moorage fees, although we did find a couple of marinas that had coin-operated electric meters. The one in Helgoland was particularly problematic: the machine was not emptied over the weekend, and as the coin box got too full, the rejected coins were spit out the coin return slot and right into the drink. Well, that about wraps up the blog for 2017. We plan to return to Europe next May to continue the adventure. We'll keep the same notification list going, but do let us know if you'd like to be taken off, or if you have friends who'd like to be put on the list. Best wishes to all! Click here for more photos of our time in Suffolk Yacht Harbour, Felixstowe and Ipswich. Above: View of the River Orwell from the plains above Suffolk Yacht Harbour. We are the proud owners of S/V Sequoia, Outbound 44 hull #5, built for us in Shanghai, China in 2001. [...] In 2003-04 we crossed the South Pacific to Australia; in 2008 we sailed to Glacier Bay and back -- those voyages and many others are described in full detail, with lots of pictures, at Sequoia's website, www.svsequoia.com. Our present voyage will take us to Europe (especially northern Europe) and back to Oregon. In our other lives, we're both musicians, members of Portland Columbia Symphony and Newport Symphony Orchestras, in Oregon. We're both retired from our day jobs -- Craig as an engineer with Nike (of shoe fame) -- and Barbara as an attorney with the Hillsboro, Oregon firm of Brisbee & Stockton. meeting you, again or for the first time! Putting Sequoia aboard the M/V Merwedegracht in Victoria, B.C. Photos of our preparations to have Sequoia shipped by freighter from Victoria to Europe. Joe Carr's video of Sequoia being lifted onto MV Merwedegracht in Victoria, B.C.